I am very excited to work with OpenMRS once again through this year Google Summer of Code(GSoC). Yes, I was selected to work on a project called Location Based access control in OpenMRS under the guidance of Daniel Kayiwa. 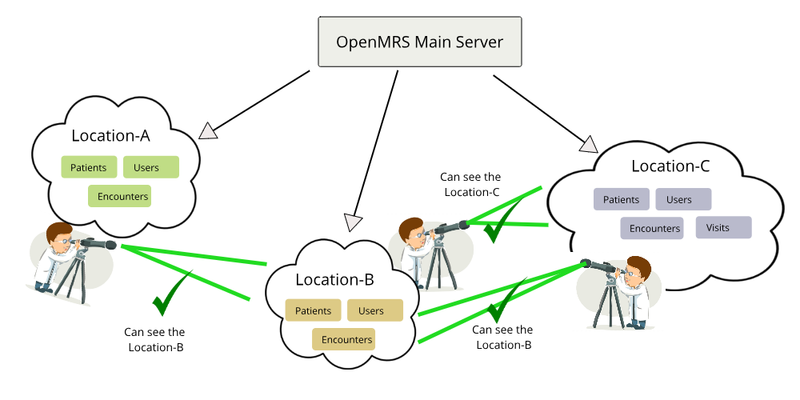 OpenMRS is an open source platform which enables the design of a customized medical records system without any of the software development experience (although it required medical and system’s analysis knowledge to use the system). OpenMRS is also a community of people working to apply health information technologies to solve problems, primarily in resource-poor environments. OpenMRS Core is the baseline of the OpenMRS development and other modules are allowed to integrate with OpenMRS Core to expand their services and features. There are multiple distributions around the world based on the OpenMRS platform. What is Location Based Access Control? Currently, OpenMRS has user privileges based access control. So the user needs to have the required privilege to access some of the OpenMRS service. Anyway, OpenMRS doesn’t have any proper location control for their services. 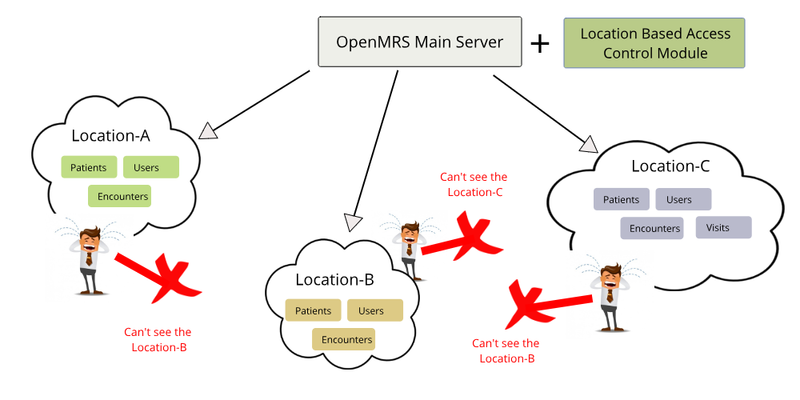 Even anyone from any location can access the stored data(eg: Patients information, Encounters, etc)in the OpenMRS. Actually, still, they haven’t concerned about the location management inside the OpenMRS. But we should prepare the OpenMRS to support the access control based on the locations. It will add more value to the data security also and accessibility also. Like the privileges based access control, we decided to implement a Location based Access control system for the OpenMRS. It will manage the access to all services based on the locations. Some implementations want to register the users and patients (the persons also) in certain selected locations. Then access them based on the location that someone has logged in. That way, if someone is logged in a certain location, they should see only those encounters, observations, and patients registered in that location. Anyway, the user who has multiple locations access (like Admin in our privilege based access control system) should be able to see patients in all locations. We can allocate multiple locations access to the System Developer or System administrator. As we planned, I have started to work on this project. As the first step, We decided to implement this feature as a separate module which can be attached to any OpenMRS distributions easily. The first phase of this project is planned to carry out through the Google Summer of Code period, and later on, it will be continued with more features. ✅ The login screen should not require users to select locations because, on login, you know the location to which a user belongs. I have to work for 12 weeks to complete the goal of Google Summer of Code program with OpenMRS. As the first step, I have worked on the Spring Aspect-Oriented programming(AOP) with OpenMRS which is the core part of our module. We decided to track the OpenMRS major services methods which are dealing with patients, users, persons, encounters, and cohorts to restrict by the locations. The first plan of our project is to restrict the patients by their locations. 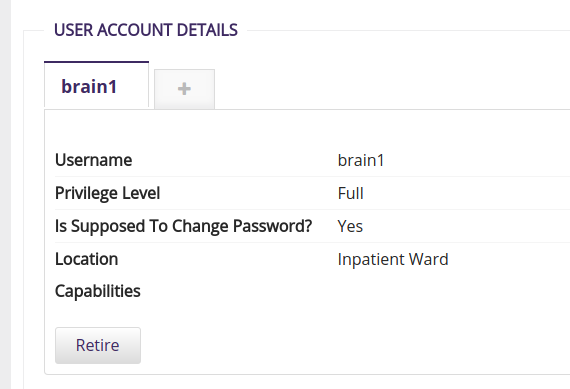 So I wanted to allow the users to register the patients with the location property which will be used to track them by the locations later. OpenMRS patient dashboard can be customized to include more fields using the app definition properties. 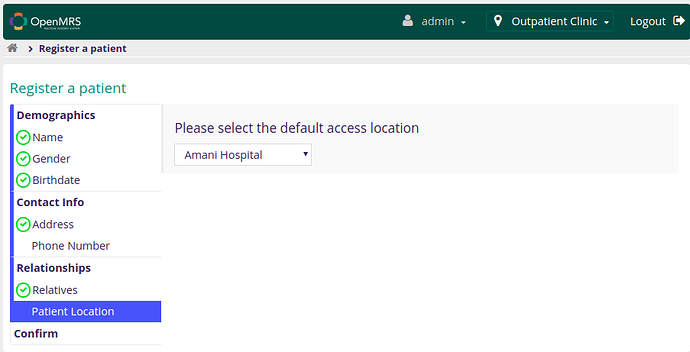 So I used this feature to attach a location selector with the Patient Registration dashboard. After this, I worked to bring this feature for the Patient EditSection which can allow users to assign the location to the existing patients. So We have provided a basic implementation to assign the locations for the patients. Then I have worked to restrict the patients by the locations using the AOP techniques. I have added the AOP Advices to track the PatientService methods which are directly dealing with the patient objects. Super Admin can only access the patients from different locations since he is the only one who responsible for the OpenMRS objects. The second phase of this project was to restrict the users by the locations. The ultimate target of this goal is to avoid the location selector from the login screens while logging-in to the OpenMRS. The user registration was done in the OpenMRS AdminUI module, and I can’t make any required changes on that dashboard to assign the locations during the registrations. So we decided to add more feasibility to the user registration dashboard to customize the registration fields using the OpenMRS extension configurations which can easily decouple the modules from the AdminUI. So I worked to implement this feature in the AdminUI module — User registration dashboard, and added support to autosave the field values with the dashboard updates for Person Attributes and User properties (the third party module doesn’t need to handle the update of that field information if it configured as a personAttribute or user property, it will be automatically saved by the Account dashboard itself). Modules can create the separate extensions to include the custom view fragments to view the custom field information. Finally, I have used this feature to include a custom location selector in the user registration dashboard to allow the users for selecting the locations during the registrations. I configured to save that location information as the user property for that respected user. Currently, OpenMRS requires to select the locations during each user logins and that location is kept as a session variable in the web layer for the future usage. Since I have already added the feature to assign the locations to the users by the location properties, It can be able to fetch the user location again from the user property. So no more requirement to select the locations during each login. Finally, I have removed the location selection from the login screen. If the user doesn’t contain the location user property(for existing users who haven’t the location user property) will be redirected to select the locations again. OpenMRS Data Export feature should only export the information from the logged in location. So I have worked with my mentor to analyze those scenarios and added solutions to restrict those by the locations. We had a brief discussion about each and every pull requests for the tickets and my mentor reviewed those pull requests as soon as possible to hurry the project implementation. Actually, he worked me to review each and every line of the pull requests to improve the code quality. I was able to learn much about the code quality and the techniques through those pull request reviews. LBAC-1 : Abstract design for the location based access control project. EA-138 : Failed to load all the patients if one patient is missing in the lastViewedPatient list. This is the mid-term presentation for OpenMRS about the project. I have added some demonstrations about the project in this video. Not like last, This time I was able to dive more into the OpenMRS. Yes, I had a chance to make a new module for OpenMRS this time. I have worked with Java, Spring, and Angular during the project time, and got a lot of experience for the better programming and about the quality of the code. I would like to thank my awesome mentor Daniel Kayiwa who helped me a lot during the last three months. I never felt about the remove working during the GSoC time, Since I was able to get the reply for each questions and discussions quickly from my mentor. The OpenMRS community also helped me a lot to clarify my problems and issues during the development time in the multiple components of OpenMRS. Again a change to…. Write Code, Save Lives…. !